Product prices and availability are accurate as of 2019-04-20 06:28:06 UTC and are subject to change. Any price and availability information displayed on http://www.amazon.com/ at the time of purchase will apply to the purchase of this product. 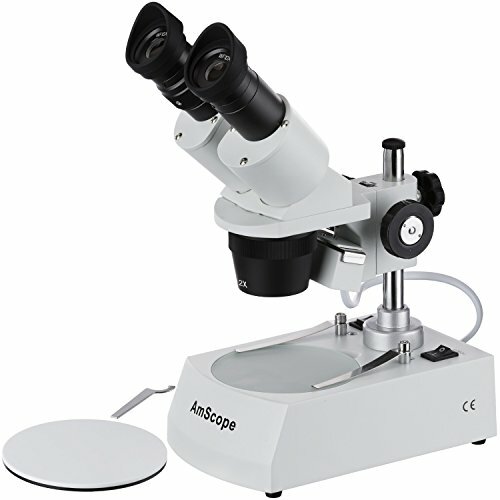 The AmScope SE306R-P20 stereo microscope has a pair of 20x10mm widefield eyepieces, 2x and 4x objectives, upper and lower halogen lighting, two stage plates, and a pillar stand. The forward-mounted binocular viewing head has an interpupillary range of 55 to 75mm and a 45-degree inclination to ease viewing for young users. 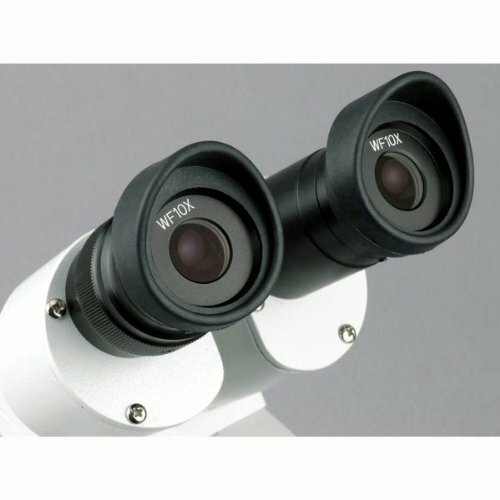 The WF20x10mm eyepieces combine with the 2x and 4x objectives to provide 40x and 80x magnification, and a longer working distance for inspecting large-scale specimens that require handling or repair. The optical glass lenses provide sharp images, and are fully coated to ensure high-resolution images. Dioptric adjustment accommodates individual eye-strength differences, and eye guards ensure comfortable viewing. 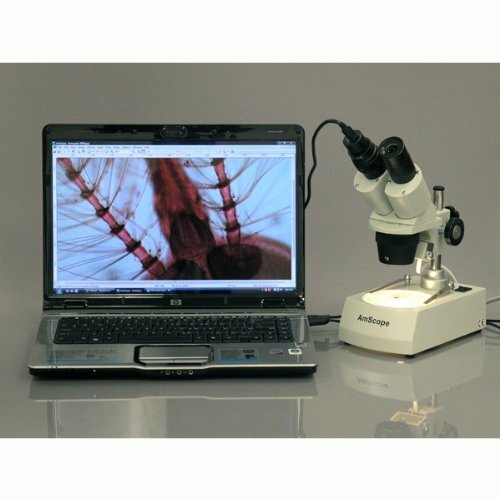 A stereo microscope, sometimes called an inspection or dissection microscope, has low magnification and a long working distance that enables users to manipulate the object being inspected. 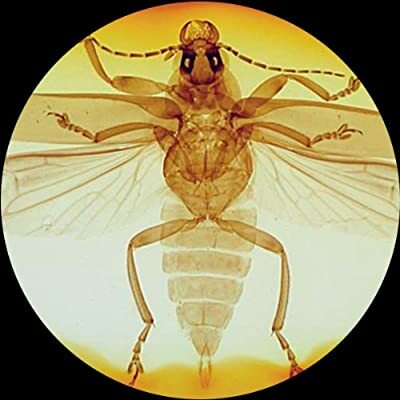 The microscope has upper (episcopic) illumination that reflects light off the specimen for enhanced visibility of opaque specimens, and lower (diascopic) illumination that transmits light up through the specimen for enhanced visibility of translucent and transparent objects. 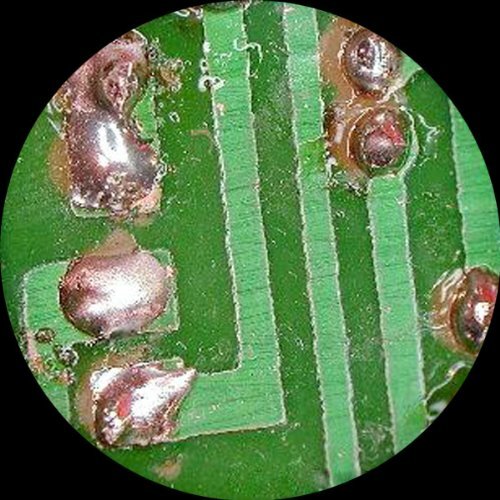 The 10W halogen light source provides bright light in a concentrated path. The pillar-style stand secures the head for precise focusing, and bilateral coarse focus eases use for left- and right-handed users. The stage has a frosted stage plate for use with lower (transmitted) lighting, and a reversible black and white stage plate that provides contrast with light- and dark-colored specimens when used with upper (reflected) lighting. Stage clips that secure the specimen during viewing. 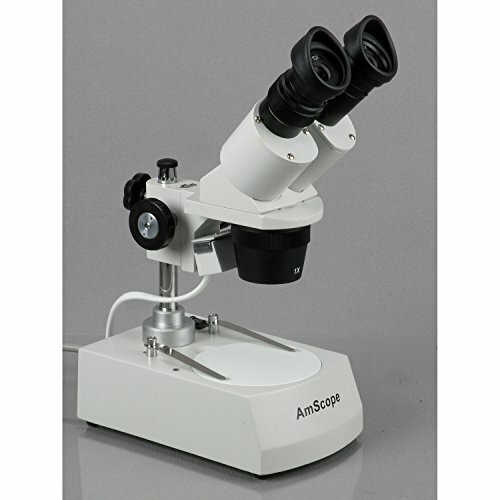 The microscope has a 2-1/8" (53mm) working distance. All metal construction is durable and stain-resistant.